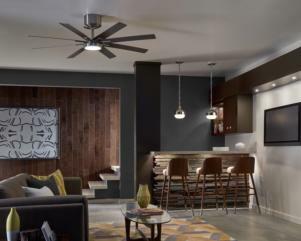 The modern Empire ceiling fan by Monte Carlo makes an impressive statement with a 60” sweep across the eight blades, each featuring a simple, rectilinear blade iron. The Brushed Steel housing is ultra-sleek. The motor’s housing hugs the ceiling, while the drive shaft brings the fan and integrated 15W LED downlight (740 net lumens, 2700K CCT and a CRI of 80+) closer into a space. A finishing cap is also provided if the fan is to be used without the LED downlight. Dual blade finishes are Gloss Silver/Gloss Walnut (shown). A two-in-one remote (combo hand-held and wall mount) with six speeds, reverse and LED light dimmer is included and the fan has a DC motor for powerful air flow and energy efficiency.